“A great read is a few seconds away,” proclaims the Sony Reader Daily Edition screen as it tries to connect to the Sony store--or to do anything else involving the unit’s wireless Internet access. Unfortunately, in my tests, I had to wait a lot longer than a few seconds. That’s too bad, because the Sony Reader Daily Edition ($400 as of February 3, 2010) has content that I would love to download if doing so were less of a hassle. The Daily Edition is Sony’s first e-reader to provide wireless access to content (via AT&T’s 3G wireless network), and Sony has sought to capitalize on that feature by offering not just a bookstore but wireless delivery of newspapers, either by subscription or as single copies. Several big names in daily print U.S. journalism--including the New York Times and the Wall Street Journal--are for sale in Sony's Reader Store, which you can access from the device. By the way, you can transfer commercial and free content to the Reader after using the included USB cable to attach the device to your PC. In fact, this is the only way to patronize bookstores other than Sony’s (you can buy from any e-tailer that supports ePub with Adobe Content Server 4 encryption). 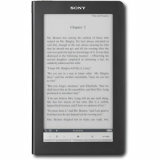 Like other Sony Readers, the Daily Edition also supports AAC, BMP, GIF, JPEG, MP3, PDF, PNG, RTF, and TXT file formats, plus Sony’s old BBeB e-book format, in case you have older e-books on hand. Wireless services and a slightly larger (7-inch-diagonal) E-Ink screen that supports 16 shades of gray are the chief distinctions between the Daily Edition and the Touch Edition released last fall: The latter has a 6-inch-diagonal, eight-shade-grayscale display. But the extra real estate mainly extends the height of the Daily Edition, so it seems rather tall and narrow for an e-book reader. It’s also a tad fatter (0.6 inch thick) and heavier (12.75 ounces, including the included black cover) than the Touch Edition (0.4 inch thick and 10.1 ounces). Sony offers a cool cover with a built-in reading light for the Daily Edition, as a $60 option. Like the Touch Edition, the Daily Edition has a touchscreen that you can manipulate with your fingers or with a stylus that slides into the device’s upper left corner. You can turn pages forward (but not backward) with a finger swipe, and you get to choose whether to use left-to-right or right-to-lift action for this purpose. This feature generally worked well, but the device was unresponsive to my swipes intermittently, and ultimately I found it less annoying to depend on the hardware page-turn buttons below the display. You fire up the Reader by sliding a button on the upper left edge. Doing so brings up a Home screen with large icons, starting with a thumbnail cover of your most recent reading material on top and your other available books in the middle. At the bottom are icons for accessing your periodicals, other collections, and notes; and below them are tabs leading to the online bookstore, applications, and settings. Navigating among options seemed a bit slow, but not as slow as on other devices. Sony supplies several built-in applications--an image viewer, a handwriting utility for capturing notes or doodles, a memo pad, a dictionary, and a music player. I particularly liked the handwriting utility, which did a nice job of interpreting my scrawls and sketching. The Reader remains primarily a reading device, but the included apps complement that primary purpose (the dictionary, for instance, can come in quite handy). I was less impressed by the shopping experience that the device permits. The store took a while to display, and when it came up, it was neither intuitively organized nor particularly attractive. At the top were several text links, some of them rather cryptic: Subjects (which lists general book categories), Sections (which includes things like bargain-priced books), Periodicals (newspapers, for example), and Bundles (several books sold together). Next to these was an unappealing reproduction of a New York Post front page. Below came icons for various best-sellers and then for new arrivals. And below those, a small banner ad appeared. Sony clearly has some distance to go before it catches up with Amazon’s excellently organized Kindle storefront. The newspaper features, though, are compelling. The longer display dimensions mean that you can view more newspaper headlines on a single page. And if you subscribe to a newspaper and leave the device’s wireless adapter turned on overnight, you’ll have the new day’s edition waiting for you when you wake up (Sony says that the online Wall Street Journal even offers an automatic afternoon update for its Daily Edition customers). You can also opt to keep several days’ worth of content loaded on your Daily Edition, so you can catch up on the news at your leisure (the device has approximately 2GB of internal memory and can accommodate an SD or Memory Stick expansion card if that’s not enough). Oddly, even though the Daily Edition uses a GSM service, it doesn't currently support international roaming (which is the best reason to go with GSM technology). For now, at least, you can purchase and download content wirelessly only when you’re in the United States and within range of a decent AT&T signal. Since the newspaper support is the best reason to shell out $400 for this device, I’d be wary of making the investment unless I was confident of the quality of the available network support. Sony's first wireless e-book reader, though pricey, offers first-rate newspaper support--but only if AT&T's service cooperates.